After years of debate, the Los Angeles City Council did something eye-opening this past August: It voted to create hundreds of miles of new protected bike lanes, shrinking some streets in the process. Considered as much a symbol as a road map, the Mobility Plan 2035 faced opposition before it even passed, with various councilmen floating amendments to remove lanes from their districts. And whatever projects do survive could take years to build; the plan has a two-decade arc, a long time to wait if you’re a cyclist trying to ride on streets dominated by aggressive, distracted, or pissed-off drivers. Don’t get me wrong: I love cycling in L.A. Since I moved here from Pennsylvania a year ago, I’ve logged about 10,000 miles on my bike, commuting and exploring the city. Every weekday I ride 17 miles from my home in the South Bay to my office in Mid Wilshire and then back. In a car the trip is a grind, taking me about 50 minutes during rush hour. Pedaling pretty hard, I can do it in an hour. Though folks in Silver Lake and Echo Park may demur, the terrain is generally flat; hot summer days here are better than humid ones elsewhere. As for winters, did I mention I moved from Pennsylvania? I’m lucky to have arrived during a massive upswing in cycling. Between 2006 and 2013, the number of bike commuters in the area doubled, with perhaps 100,000 Angelenos using bikes daily. I’d bet that we would see far more if people felt that pedaling the streets was safer. Just look at Santa Monica, with its extensive grid of bike lanes. From 2000 to 2014, ridership rose 356 percent; that doesn’t even factor in the bike-share program, which launched this year. Turn back to L.A., and you see similar dynamics: In a survey conducted by the Los Angeles County Bicycle Coalition, overall ridership increased by a modest 8 percent between 2011 and 2013 but more than doubled on streets with bike lanes or sharrows (arrows that mark shared lanes) during that period. My daily commute, for instance, is terrific as it travels along bike paths, bike lanes, and relatively quiet neighborhood streets before dumping me into a gantlet of roaring traffic that I call the Thunderdome. It sits where Venice Boulevard meets the 10 and La Cienega Boulevard. To pass through on my way home, I must avoid cars jockeying to get on the freeway and buses muscling into the bike lane to make stops or turns; then I have to cross four lanes to get into a left turn lane as cars zoom by before I sprint to catch the light and arc onto a side street. Now imagine doing that during the winter—in the dark. Riding along Santa Monica Boulevard between Century City and Westwood might be even more stressful. That there’s a bike lane at all is wonderful, but it vaporizes right before you approach the 405, dropping riders into a chaotic intersection with no protection. Going the other way, the lane disappears a few hundred yards from Beverly Hills, spilling riders onto a virtual freeway. These gaps reflect a distinctive challenge of designing and building bike lanes in Los Angeles: Logical routes require the cooperation of multiple agencies and municipalities. The Santa Monica Boulevard bike lane, for example, can’t grow without the backing of Caltrans and Beverly Hills. Located as it is between huge swaths of L.A., Beverly Hills is a keystone, but community support to create a single east-west route through town just doesn’t exist. “The city has thrown cyclists to the dogs,” says Mark Elliot, a Beverly Hills resident who was educated as a city planner and runs the Web site betterbike.org. “The present policy is just built around trying to speed regional traffic through town as quickly as possible, and there’s not really a safe place to ride.” A lengthy public discussion about extending the Santa Monica Boulevard bike lane through Beverly Hills was tabled by the city council, then killed in committee deliberations in July. Here and all over the region, cyclists must wait for safe places to ride—and pray they don’t get hit. Especially not with so many drivers on their phones. Research conducted by AT&T earlier this year found that seven out of ten people engage in “smartphone activities” while driving, including more than 50 percent who admit to using Facebook, Twitter, or Instagram behind the wheel. The statistic doesn’t surprise me. Every day I see hundreds of drivers talking on a smartphone, texting or e-mailing, looking at Facebook, and who knows what else. Once, on Curson near Pico, a black Mercedes swerved into my path and the side mirror grazed my hip. I rolled up to the guy’s driver’s side window at a red light; he had his phone on his lap, watching a video. Without saying a word, I just rode away, bewildered and angry. Each day drivers see countless acts of idiocy committed by other drivers—running lights, playing on smartphones, changing lanes without signaling, tailgating, turning from the middle lane, driving too slowly, driving too fast. I always wonder why a guy who breaks all these rules at 50 mph in a two-ton Porsche Cayenne is so bent out of shape about what cyclists do at 5 mph. Who’s more likely to kill someone? Nonetheless lots of motorists seem particularly peeved by the few cyclists they may encounter on a given day. I have been honked at plenty of times for rolling through stop signs, but there’s a simple reason so many cyclists do it: The rule just doesn’t make sense for riders. Drivers need to stop in order to have the time to assess conditions at an intersection. But if I cautiously approach an intersection, I can hear and see things far sooner than anyone driving at speed—with windows up, the radio and air-conditioning on. 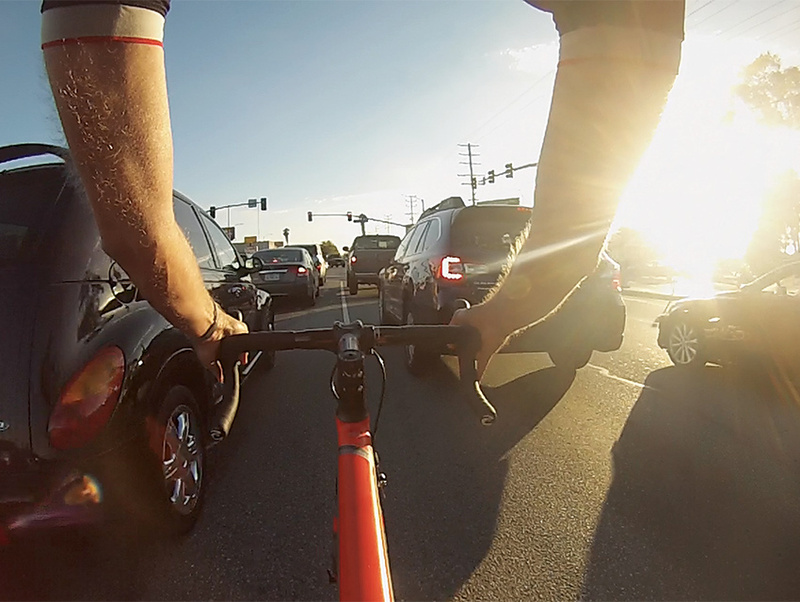 As long as I don’t cut someone off, I’ll slowly glide through the intersection, which can infuriate some drivers. Yet when I do stop, I usually feel an impatient driver right on my wheel. Or a driver will wave me through. Whether the gesture is out of graciousness or impatience, either the driver believes they can choose how to administer the law or don’t understand it, which is a whole other problem. Still, I have hope. And not just because of the Mobility Plan, which has greater ambitions for low-income neighborhoods and connectivity with mass transit. Next spring L.A. will at last get something that New York, San Francisco, Chicago, and scores of other cities—even Santa Monica—already have: a bike-share program. Limited to downtown, it’s not the ambitious citywide system originally called for. But together with projects like the Expo Line bikeway and the LADOT’s new focus on building network neighborhoods, it gives people like me reason to believe that the lines on the cycling map will eventually cohere into a functional network. CicLAvia and open-street events have drawn wildly diverse crowds that include families with small kids, the millennial fixie crew, fitness riders, and everyday Angelenos. With all this—and the hills, the ocean, the plentiful sunshine—I’m convinced L.A. has the potential to be the best city to ride a bike in America. Until then, I’ll keep sprinting through the Thunderdome. People often ask me why I ride in L.A.—why I arrive at work glistening and bike on rainy nights and risk injury. This is like asking why I’ve chosen to live somewhere crowded and expensive and dysfunctional. L.A. is crazy beautiful, and the bike is perfect for it. My commute costs basically zero. While others struggle to make time to think or exercise or find adventure, I check those boxes twice a day. While you’re hypertensive in traffic listening to NPR, I have seen dolphins frolicking (and homeless men fighting over a shopping cart); I’ve smelled the taco trucks and heard all the languages of kids playing at morning recess. I sweat and shiver; I feel elation and real fear. In short, I feel alive. And so I ride. Peter Flax, the former editor of Bicycling magazine, is features editor at The Hollywood Reporter. Next articleAsk Chris: Who Put the Brakes on Drag Racing in Long Beach and San Fernando? Was It Too Dangerous?